The coyote is Minnesota's most abundant large predator. Coyotes usually prey on small mammals, but sometimes they kill large mammals and livestock. Coyotes typically don't get along with their larger cousins, the timber wolf. 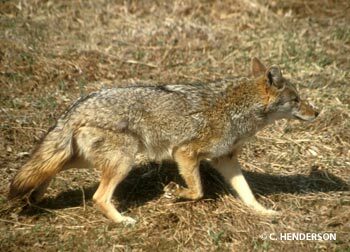 General description: Coyotes resemble a small, lean German shepherd with a bottle-shaped tail. Its fur is long, coarse, and heavy. Coyotes also have large, bushy tails, and long, erect ears. Weight: Adult female coyotes average about 25 pounds and males about 30. Color: Shaggy, grayish coat; white at throat and belly. Sounds: In autumn, coyotes are vocal. They howl or bark alone or in groups. Younger coyotes have higher pitched voices than adults. A coyote's yipping sounds can be heard for miles. Coyotes begin to mate at age two, and may pair for life. The mating season begins in January and lasts through February. After breeding, females search for dens, either digging one in loose soil or enlarging the den of another animal. Five to seven pups are born in April. The pups are born blind, but they soon can see. When they're eight to 12 weeks old, the female teaches them to hunt. From autumn until mid-winter, the pups leave the den and begin to search for their own territories. Carrion, mice, snowshoe hares, porcupines, and occasionally, livestock such as sheep and small calves. Wolves. Human hunters and trappers kill coyotes for their fur. Coyotes are nomads. Males may roam over territories as large as 36 square miles, though females usually stay within a six square mile area. Adult male coyotes may share the territory of two or more females, which may overlap the ranges of other males. Coyotes normally move two to three miles per day. They are found throughout the state. They are increasing in southern Minnesota, including the Twin Cities area. Coyotes prefer a combination of farm land and forest habitat, but survive well in the prairie or dense forest areas. Most coyotes live less than two years in the wild, though one animal is known to have reached 13 years of age. It's difficult to estimate coyote populations. Densities vary from one coyote for every three miles during high population years to one coyote for every five or six miles during lower population years. Coyotes can be harvested by hunting and trapping. In Minnesota, roughly 4,000 are shot or trapped each year. Coyotes were once common on Minnesota's southern prairies but were quite rare throughout northern forests. After widespread logging and fire created better habitat for small mammals, coyotes began to extend their range. Due to intensive agriculture, their numbers dwindled on the prairies. In recent years, however, the coyote appears to be increasing once again in southwestern counties. A DNR study showed that some coyotes eat porcupines. Researchers believe coyotes kill porcupines by flipping them over and grabbing their throats. As a result, many coyotes are injured by the porcupine's sharp quills. Coyote fur is soft, warm, and luxurious and is often used as trim for parkas.